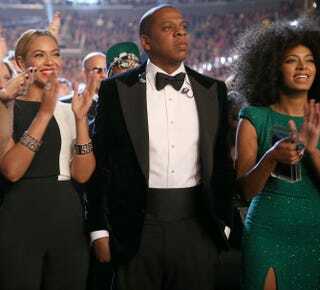 Actress Jessica Biel, singer Beyoncé, rapper Jay Z and singer Solange Knowles attend the 55th Annual Grammy Awards at the Staples Center Feb. 10, 2013, in Los Angeles. You can now add one more person to the country’s dim unemployment statistics. After an internal investigation, the Standard Hotel has fired the person responsible for leaking the video of the infamous fight between Solange and Jay Z that took place in the hotel’s elevator. Us Weekly reported that “the video was recorded on a cellphone from the monitors in the back room.” Another source told the New York Post that the video was shopped for five days and went to the highest bidder. Well, if the person truly did receive $250,000 for the tape, hopefully he or she spends it wisely, because in this economy, jobs aren’t a dime a dozen. Or should I say $250,000 a dozen?